Obama will visit South Dakota … Finally. President Barack Obama has visited 49 of the 50 states as sitting president. He is slated to visit his last state on May 8, becoming just the fourth sitting president to visit all 50 states. Which state is last? South Dakota. “I can’t let my South Dakota friends feel neglected,” Obama told KSFY-TV, a local television station in Sioux Falls. While Obama was joking the fact that South Dakota is the last state to be visited by the president is symbolic of how the rest of the United States considers the state, it it considers it all. South Dakota is famous for hosting the Badlands, Mt Rushmore and the Black Hills. Situated on the Great Plains with scores of rolling prairie, the state is aesthetically beautiful if remote from the economic hubs of the United States. It is this isolation that has allowed such egregious systemic racism to fester. South Dakota rarely figures largely in news stories. It’s not a swing state, it’s politics are largely unfamiliar to the general public. However, the American Indian Movement that erupted in the 1970s and that continues in various iterations to the present day is headquartered in South Dakota Indian Country. Thus, the history of the racial animus directed toward members of the nine Lakota Sioux tribes in South Dakota has begun to garner attention. The recent ACLU case Oglala Sioux Tribe v. Van Hunnik marked the first time the federal government ever interceded in South Dakota’s federal court. The case, which was a landmark for Lakota People’s Law Project effort to force South Dakota officials to recognize the Indian Child Welfare Act, shows the federal government is paying more attention to political affairs in the state. While South Dakota is the President’s last state to check off his itinerary that is not to suggest his administration has been deaf to the concerns of Indian Country, particularly, the Lakota tribes. The President and the First Lady became one of the handful of American Presidents to visit an Indian reservation while in office when he visited the Standing Rock Indian Reservation, which straddles North and South Dakota. The Obamas visited Cannon Ball, North Dakota, so technically they haven’t been to South Dakota but it is clear they are aware of the history of discrimination against Indian people. 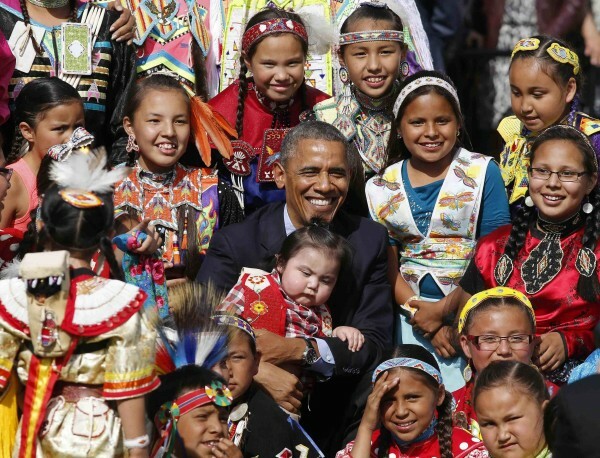 But what really impacted the Obamas is their meeting with Indian children, who shared stories of their harrowing upbringing and the difficulties of maturing in adverse circumstances on the reservations. Since that day, the Obama Administration has released updated ICWA guidelines specifically designed to curtail the flagrant violations in South Dakota. Attorney General Eric Holder gave a lengthy speech where he promised greater enforcement of federal provisions aimed at preventing state abuse of Natives. The Government Accountability Office released a report saying the U.S. Department of Health and Human Services needs to respond to the needs of tribes in a more comprehensive and timely manner. Finally, Michelle Obama released a lengthy statement that described the need for the United States of America to develop more and fuller tools to help uplift the tribes that are struggling directly as a result of white oppression. The importance of the speech cannot be overstated. It mirrors what LPLP has been asserting for the past decade and it shows that while Obama’s itinerary may have overlooked South Dakota, the policies of his administration will not. To make comments about the long time systemic discrimination & abuse as causing poverty & violence for the Lakota people is known. What about doing something about the issues in South Dakota and stop taking the Lakota children away from their families for a start. Work with the people. What is he up to now,what does he have up his sleeve ,and will surprise us with now,as far as I know,the Dakota people are the highest percentage,living in poverty,what has he really done,theres a certain celebrity that is building homes for the American native Indian,GUESS WHO,I wont tell,really what has President OBAMA done for us,do you remember OBAMA CARE, we need to do our research, and the conclusion is,his pushing us into BANKRUPTCY,and the taxpayers are losing out, and paying for everything. Not about Obama……. I am looking for information…… I received a plea to help Lakota children. From St Joseph Indian School in Chamberlain SD. Is this school legitimately helping Lakota children, or are they in on the despicable removal of children from their homes or even worse? They say that the donation is for ‘bedding, clothing and warm meals’ for the kids……. please let me know if this place is supported by the Tribes…I doubt that it is……….